I found this sleeveless wrap top quite by accident. 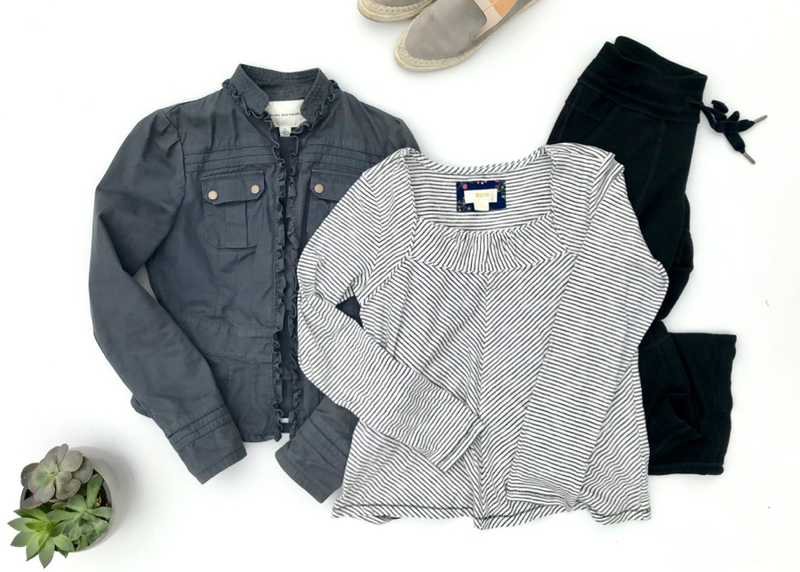 It was tucked between all the long-sleeved winter sale items but had also been marked down. There are four reasons, why I couldn’t resist it. The ruched side and the diagonal stripes make it much more interesting than a striped tank. Unlike so many white tops, it is not sheer. Because this top is made of modal (lightweight, soft and stretchy) it can also be your casual staple. Wear it with almost any casual bottoms: cropped jeans, skorts, shorts, or skirts. 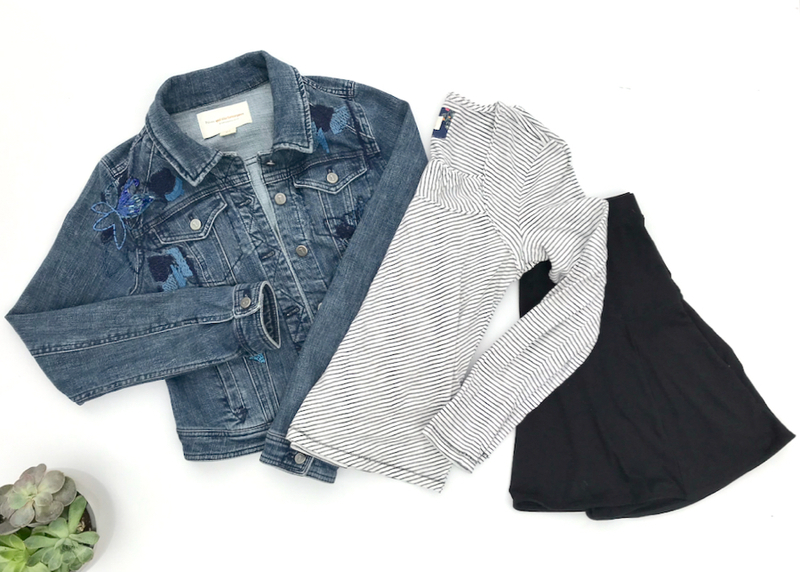 I styled mine with a denim skirt and a knit jersey open-front cardigan. While I was at Banana Republic, I also tried on their Threadsoft Cross-Front T-shirt. I really liked this style too, for 3 reasons. It is soft, stretchy and not see-through! Since I’m under 5’4″, the top is long enough to cover my assets when I wear skinny jeans or leggings. The crossover detail on the hemline makes it more interesting than the average striped t-shirt. This two-color pinstripe is easy to match with other prints like florals, polka dots, animal prints or even other stripes. If you need help in matching prints, you’ll find a link at the bottom of this post, for some helpful tips. Of course, you can always wear this with white jeans, blue jeans, tan pants or any other solid color spring bottoms. You may be surprised to hear it, but this square neck striped top is not from Banana Republic! It’s from another one of my favorite stores: Anthropologie. There are 3 reasons why you might want this top. A square neck makes a nice change from the typical round and v-neck tops. 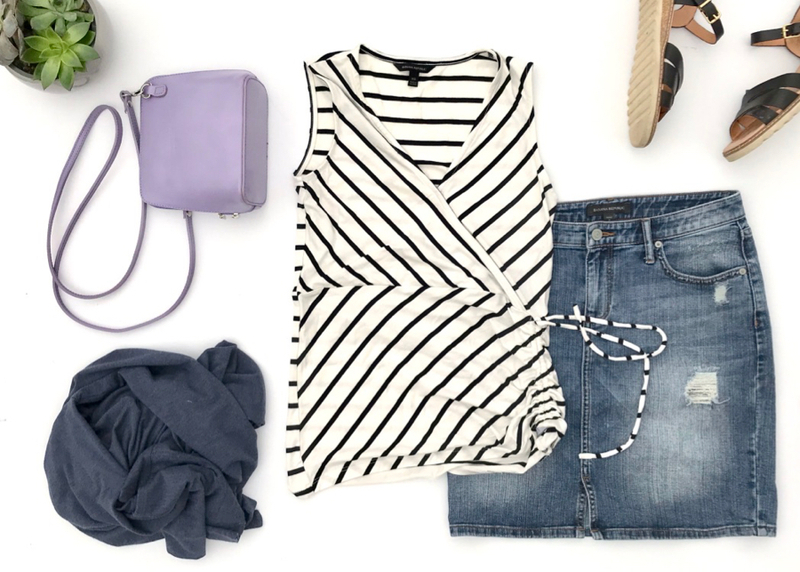 The patchwork stripe makes this top more interesting than a basic striped t-shirt. It’s a shorter top so it works with pants and skirts that are wider or have more volume. These are my Athleta super soft wide leg pants, that I pull out any time I’ve gained weight, feel grumpy or just need to be comfortable! (These ones are similar.) Any casual jacket works with this look, or if it is warm enough to go without, wear a necklace or scarf to complete your look. This top would also look great with jeans, pants in any color, or a midi-skirt. I’ll be adding more outfit inspiration to my Instagram account over the next week, so be sure to connect with me there. I’ll also pin more shopping options to my Spring/Summer 2019 Style Pinterest Board. P.S. Don’t forget to subscribe to my blog so that you don’t miss my next post! I love striped tops and those are some great outfits you put together. I love that gray (slate blue?) jacket with the small ruffle. Really cute. I love navy and white stripe tops, too. They always look so crisp and classic. A favourite of Mme. Chanel. I like your styling choices. 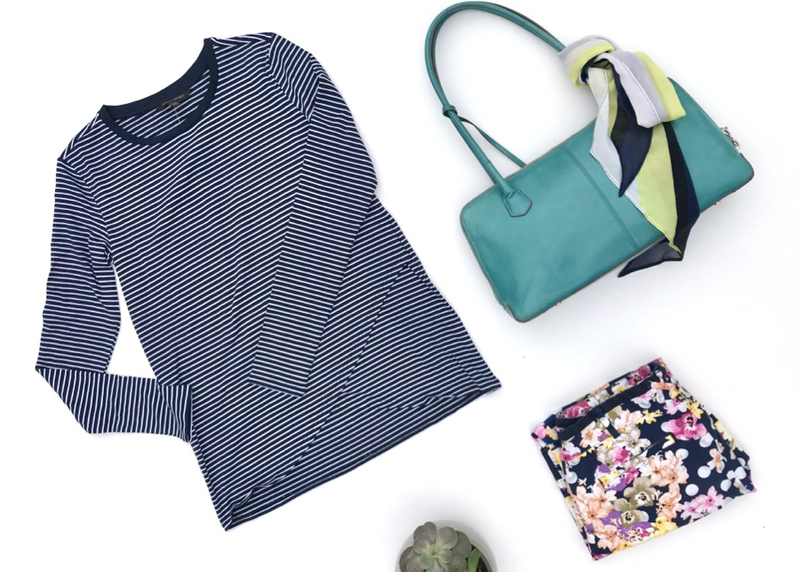 I love the way you’ve styled the striped tops – all great suggestions! It’s been a while since I’ve had a striped shirt but I really love your choices – especially that last one from Anthropologie.